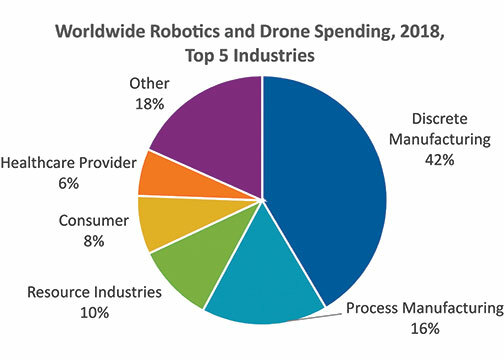 Source: IDC’s Worldwide Semiannual Robotics and Drones Spending Guide, June 2018. Framingham, MA—International Data Corporation’s updated Worldwide Semiannual Robotics and Drones Spending Guide forecasts worldwide spending on robotics and drone solutions will reach $201.3 billion in 2022. In addition, IDC reports that this joint category will achieve a compound annual growth rate (CAGR) of 19.6% over the 2017–2022 forecast period. Moreover, robotics and drone spending will hit $95.9 billion in 2018. Spending on robotics solutions is expected to total $86.6 billion in 2018, according to IDC. Moreover, it will account for more than 85% of all spending throughout the five-year forecast. 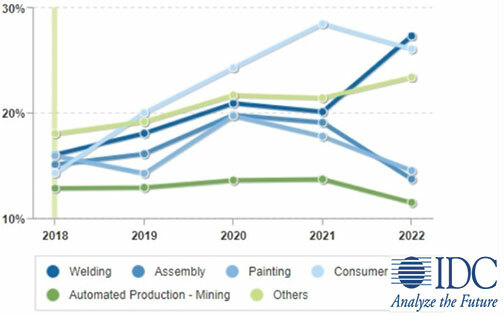 Industrial robotic solutions will account for the largest share of robotics spending (more than 57%). This will be followed by service robots and consumer robots. Discrete and process manufacturing will be the leading industries for robotics spending at more than $54 billion combined in 2018. The resource and healthcare industries will also make significant investments in robotics this year. However, the retail and wholesale industries will see the fastest robotics spending growth over the forecast with CAGRs of 32.7% and 30.7%, respectively. Worldwide drone spending is predicted to be $9.3 billion in 2018. In addition, IDC expects it to grow at a faster rate than the overall market, with a five-year CAGR of 32.1%. Enterprise drone solutions will deliver more than half of all drone spending throughout the forecast period. Consumer drones will make up the balance. According to the report, enterprise drones will increase its share of overall spending with a five-year CAGR of 37.1%. The utilities and construction industries will see the largest drone spending in 2018 ($925 million and $808 million, respectively). Furthermore, key growth in drone spending will come from various other industries. They include education (72.8% CAGR) and federal/central government (70.1% CAGR). “In addition, as safety continues to be a major concern for consumers and regulators, vendors and IT suppliers are working to alleviate concerns by building drones with multiple redundancies, improving their sensory and collision avoidance technology, and testing 5G-enabled drones to enable greater connectivity while lowering latency,” added Soohoo. For drones, the use cases that will see the fastest growth over the forecast period include dispensing pesticides and fertilizer (109.4% CAGR); emergency service (86.4% CAGR); and precision agriculture/crop scouting (86.1% CAGR). Purchases of drones and after-market drone hardware will be nearly $7.9 billion in 2018. Furthermore, IDC sees spending on command and control, specific drone applications and network infrastructure software will reach $611 million. In addition, IDC believes the United States will be the largest geographic market for drone spending at $4.3 billion in 2018. The U.S. will be followed by Western Europe and China. However, exceptionally strong spending growth in China (63.2% CAGR) will move this market ahead of the United States by 2022.
International Data Corporation (IDC) is a global provider of market intelligence and advisory services. It caters to the information technology, telecommunications and consumer technology markets. With more than 1,100 analysts worldwide, IDC offers global, regional and also local expertise on technology and industry opportunities and trends in 110 countries. International Data Group (IDG) is the parent company of IDC. IDG is a leading media, data and marketing services company that engages influential technology buyers.